While visiting our local coffee shop a couple of weeks ago, I signed up to participate in a Bake Off event to help support a great Canadian charity. SchoolBOX is an organization that helps send communities in Nicaragua to school. SchoolBOX constructs schools and provides its students and teachers with the necessary tools to bring literacy to life. Equator Coffee Roasters‘ Bake Off event was this past Saturday. From this bake sale, they raised well over $500 for SchoolBOX. I decided that these cookies were perfect to bring to Equator Coffee for the sale. Cookie monsters will go wild with their serious knock your socks off flavour! The original recipe comes from Chloe Coscarelli’s awesome vegan cookbook, “Chloe’s Kitchen”. I tweaked the recipe a bit by making them gluten-free and replacing the brown sugar with coconut sugar. As well, I substituted 2 tablespoons of a strong brew of espresso coffee for the instant espresso powder. Whisk together flour, xanthan gum, baking powder, cinnamon and salt in a medium bowl. Using a mixer, beat vegan margarine, powdered sugar, and coconut sugar until well combined. Mix in the flour mixture about 1/2 cup at a time. The dough will appear a little dry. Add brewed espresso coffee and mix. Stir in chocolate chips. Using tablespoons, scoop out dough and roll in a small plate of granulated sugar. Place each scoop on prepared baking sheets. Cookies will spread in the oven, so allow for some space between each. If you love crisp cookies like myself, then gently flatten the dough with the palm of your hand. Bake for about 12-14 minutes. Let cool before placing on a wired rack. I store this mix in a large glass container and keep it in my fridge. This entry was posted in Desserts and Snacks and tagged cinnamon, coffee, cookies, gluten-free, vegan on April 29, 2013 by uberdish. This was my attempt to distract the kids from diving into their Hallowe’en bags after school. And….it worked! This is not our usual after school snack which often consists of carrots and hummus. (This time of the year, a lollipop or two tends to sneak in with the carrots!). 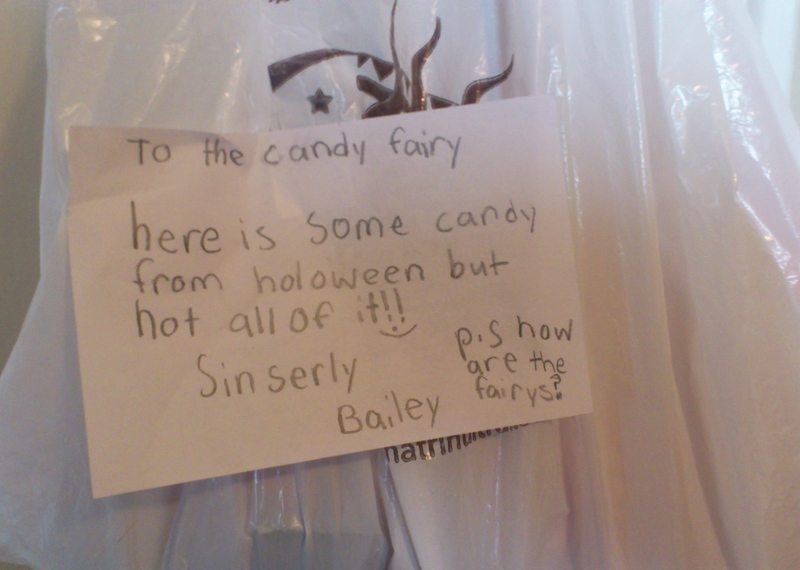 But, it is certainly healthier than all the junk my kids scored on Hallowe’en night. Made with a crispy rice cereal and chocolate chips, these cookies remind me of a Nestle Crunch Bar that I used to have as a child. The difference is, however, that these cookies contain gluten-free oats, flax meal, dairy-free chocolate, and brown rice crispy cereal. They are also not laced with artificial flavours and preservatives. Mix together butter, coconut sugar, flax gel, and vanilla in a large bowl. Add flour, xanthan gum, baking powder, baking soda, salt, oats, crispy rice cereal, and chocolate chips. Stir together. Drop batter in mounds on baking sheets lined with parchment paper. Flatten with back of spoon. Bake for about 10 minutes. Serve with a lovely cup of hot cocoa and vegan marshmallows! If you are looking for a hot cocoa mix, I bought one recently at Purest Bakery and Store in Perth, Ontario. Purest makes a gluten-free, dairy-free, gum-free hot cocoa mix from organic cane sugar (infused with vanilla extract), natural cocoa, and ground cinnamon. My kids also found some gluten-free, vegan marshmallows at this bakery. Dandies is the brand and they are delicious! 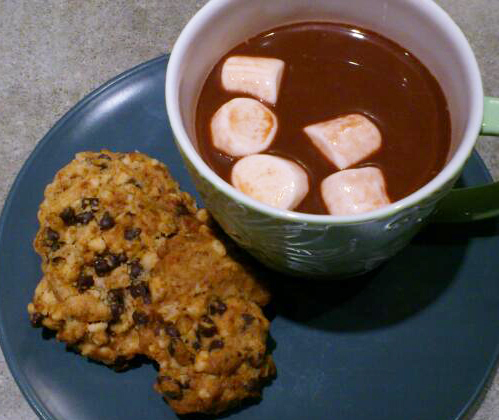 This entry was posted in Desserts and Snacks and tagged cookies, gluten-free, hot cocoa, marshmallows, oats, recipes, vegan on November 12, 2012 by uberdish.